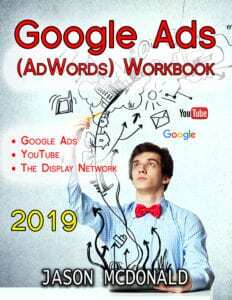 A new book on Google AdWords for 2019! Read the amazingly positive reviews! Updated for 2019. Many Google Ads (AdWords) books are old, to say the least, this one is a new book on Google AdWords fresh for 2019. Avoid the Google Ads Gotchas. AdWords has, unfortunately, four gotchas lurking to take your money. Learn what they are, and avoid them. Search Network – master advertising on Google’s Search Network, a.k.a., Google. Display Network – learn what the GDN is, and why you might want to avoid it. You’ll also learn where it offers incredible opportunities. VIDEOS – extensive ‘how to,’ ‘step by step’ videos that make AdWords advertising easy! A Systematic Approach to Google Ads. Purchase the Google Ads (AdWords) Workbook and gain access to the companion AdWords Toolbook, filled with hundreds of free tools for Search Engine Optimization as well as worksheets and a step-by-step methodology that leads you to success! ~ Google Ads is powerful! AdWords is complicated! AdWords is expensive! AdWords is fun! Three quarters of the above statements are true, and Google Ads can be your best friend or your worst enemy. Indeed, many people don’t realize that Google Ads isn’t just a way to advertise your product or service on the Google search engine. It’s also a way to get your company, product, or service on Google’s network of affiliated sites called the Display Network that includes blogs, parked domains, portals, newspapers and even YouTube and Gmail. And it’s a method of remarketing, “tagging” your website visitors so you can show and reshow them your ad until they’re ready to buy. It’s even a method to advertise on apps on mobile phones. This new book on Google Ads will teach you the lies and secrets, tips and tricks, tactics and techniques that will help you leverage AdWords to get your company, product or service to the top of Google, in video ads on YouTube, into email ads on Gmail, and placed on a cornucopia of websites in the Google Display Network (GDN) as both images and text. It will also show you the power of remarketing, how to get your ads in front of potential customers by following them across the Internet. Our goal is to first understand how best to use AdWords, and then to set up AdWords advertising in the most efficient way possible, spending the least while getting the most from each advertising dollar.